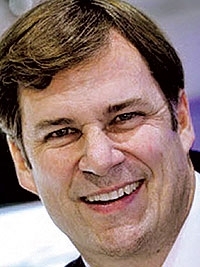 Ford of Europe President Jim Farley, who has helped lead the unit's financial recovery, will be among the speakers at the Automotive News Europe Congress June 21 in Barcelona, Spain. The American executive, who was previously head of global marketing, sales and service, was dispatched to Europe in January 2015 with a mission to restore profitability. In 2016, Ford of Europe reported a record $1.2 billion pretax profit. Farley implemented a strategy that calls for more expensive trims on some popular vehicles, while progressively abandoning low-volume and low-margin segments. Farley, 54, joined Ford in 2007 after a 17-year career at Toyota. He had been group vice president of marketing at Toyota Division, general manager of Lexus Division and spearheaded the launch of Scion.